Welcome to WALLYARD CONCEPT HOSTEL! We are the ones at whose place you can sleep in after a wild night in Berlin. Here is where you come when you want your coffee to be accompanied by a smile. We are simply your home in Berlin. Just because Berlin is our home and we enjoy sharing it. The WALLYARD is new, but our principles are old: Accommodate travellers friendly and treat them the way you want to be treated abroad. You are not going to feel as a stranger for long, that’s a promise. Above all: it is all about Berlin. The city is around you, in you, it pumps and groans und lives. And the WALLYARD right in the middle of it. 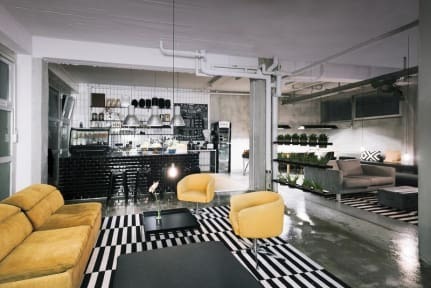 Located in Moabit, we are perfectly central with a cool integration into the Kiez. In a matter of minutes you are at the Central Station or at the Brandenburg Gate. The nightlife of Neukölln, the lifestyle of Charlottenburg and the hottest clubs of Kreuzberg are within 15 minutes reach. But maybe you just might want to look around here in Moabit. At least that would be a first insider’s tip. If you are asking yourself what defines us besides our inner values, the answer is we are good looking as well. Casual interior meets the love of adventure, meets art, meets urban jungle. We offer private rooms or dorms, a lounge and an art salon. And, of course, a laundry room, free Wi-Fi for all and real plants. When you get up in the morning there is a delicious breakfast waiting for you at the Wallyard Café, prepared with love from the mother of the house. You can enjoy it in our thoughtfully designed interior or in our backyard with the embrace of our scenic walls. 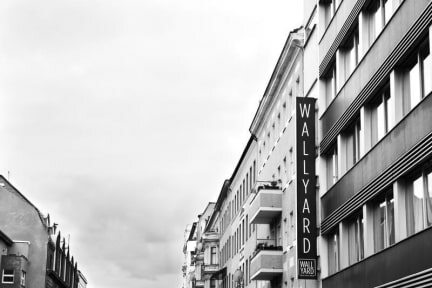 After a long discovery day through the streets of Berlin the WALLYARD bar is where you want to mingle with other travellers or just grab one before hitting the night. Отличный и удобный ресепшн по совместительству с зоной отдыха. Недорогой и вкусный завтра. Сами комнаты находятся в близлежащем от ресепшна здании. Все отлично, кроме одного нюанса. На этаж всего одна ванная комната. Наверное, мне повезло, что людей было немного. Т.к. при хорошей заполняемости могут быть проблемы.